Indian filmmakers reveal how their film got onto the second most prestigious category in Cannes and why others think Bollywood makes little to no global impact with foreign audiences..
INDIAN filmmakers stand a better chance of getting to Cannes, if their films are about local subjects and controversies. 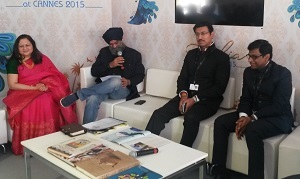 It was the view trenchantly expressed by filmmaker Bobby Bedi, who chaired the first panel discussion on the first day of the 68th Cannes Film Festival in the India pavilion and it helped to explain why there are two films from India in this year’s official selection. “Chauthi Koot” (‘The Fourth Direction’) and “Masaan” (‘Fly Away Solo’) both make the Uncertain Regard section, which is for upcoming global talents as selected by festival organisers. “Chauthi Koot” is loosely based around the troubles in the Punjab in the 1980s when the state was thrown into turmoil and strife as some Sikhs fought for an independent homeland and it led to two hugely traumatic incidents: the storming of the holiest Sikh shrine, the Golden Temple in Amritsar by Indian troops and the assassination of prime minister Indira Gandhi by her own Sikh bodyguards following the military action. “Masaan” deals with caste conflict, tradition and modernity, and is set in the holy Hindu city of Varanasi. India’s government – the first to represent prime minister Narendra Modi and the BJP – showed its support with both the ambassador, Dr Mohan Kumar, who has only been in the job 10 days and Rajvardhan Singh Rathore, speaking warmly about the two current Cannes films and international co-productions in the opening remarks as the pavilion was officially declared open. But it was Bedi who put his finger on the pulse of why India is not making films that have a wide international audience. The success of “The Lunchbox” – which is reported to have grossed $15m worldwide – reverberated through the first and second panel sessions. It premiered in Cannes in 2013 and went onto enjoy worldwide success. Bedi was elaborating on the point that often the local played out much better than when Indian filmmakers tried to make ‘international’ films. “’The Bandit Queen’ was a film about a specific region in India but it resonated internationally and it was universal story,” Bedi explained. Gurvinder Singh, the director behind “Chauthi Koot”, said he became interested in Iran through the films of the great Iranian masters: Abbas Kiarostami, Jafar Panahi, Moshen Makhmalbaf, which he first saw when he studied at the National School of Film and Television in Pune. “I didn’t know anything about Iran but I learnt about it through local stories from those filmmakers,” he pointed out. Earlier, he described how his first film, “Anhe Ghore Da Daan” (‘Alms for a Blind Horse’) won an award at the 2011 Venice Film festival but failed to find any distributors outside India. “It received a lot of critical acclaim in Venice but it failed to find a distributor outside India. This time I feel a lot of support,” he said. His current film Rs5.7 crore (roughly £600,000) film was funded to the tune of Rs Three Crores (roughly £300,000) by the National Film Development Corporation of India (the only government institution) that supports Indian filmmakers – but also crucially had French backing and UK money too and was first developed at the Hong Kong-Asia Film Financing Forum. It was where local Indian producer Katikeya Singh first met Catherine Dussart. Her French production company was pivotal in taking “Chouthi Koot” on and developing both the idea and the means of executing it. Bedi pointed that she knew all about films at Cannes, her 2013 Cambodian film, The Missing Picture triumphed in the Uncertain Regard section. “Having met him and seeing his determination to make this film and understanding and seeing how it was to be created – it was beautifully done and we loved it,” she said. Singh revealed that some money had come from the Paddy and Joan Leigh Fermor Arts Fund, which makes grants available to ‘artists’, not films. He was able to access it through British producer Olivia Stewart, who was creative producer and script advisor for the film, having been drawn to the project after seeing Singh’s first film, ‘Alms for a blind horse‘. Singh did not write a conventional script for “Chouthi Koot”, preferring to create scenes and working largely with non-professional actors. The film already has an international sales agent – Elle Driver – which is an established international film sales agent with a considerable presence in Cannes itself. The film received its worldwide premiere in Cannes today and www.asianculturevulture.com was there to see it. Every after in a though we decide on blogs that we read. Listed below would be the most up-to-date web-sites that we choose. ujrjzzo,If you want a hassle free movies downloading then you must need an app like showbox which may provide best ever user friendly interface. lfazjsadfj,Definitely believe that which you said. Your favourite justification appeared to be on the net the simplest thing to remember of. yapkli,Definitely believe that which you said. Your favourite justification appeared to be on the net the simplest thing to remember of. zkwawjlbwtn,Thanks for sharing this recipe with us!! bollvybdsqz,Hi there, just wanted to say, I liked this article. It was helpful. Keep on posting! nvoobe,Waw! Its really great and wonderful ever i found. Thank you for sharing this info. nnzdibnq,A very good informative article. I’ve bookmarked your website and will be checking back in future! peljykroxw,If you want a hassle free movies downloading then you must need an app like showbox which may provide best ever user friendly interface. zfbdktv,Definitely believe that which you said. Your favourite justification appeared to be on the net the simplest thing to remember of. wbwhuyvid,Thanks for sharing this recipe with us!! smjitbhkecu,Thanks a lot for providing us with this recipe of Cranberry Brisket. I’ve been wanting to make this for a long time but I couldn’t find the right recipe. Thanks to your help here, I can now make this dish easily. hyhmfbcjv,If you want a hassle free movies downloading then you must need an app like showbox which may provide best ever user friendly interface. joflkvukr,We have a team of experts who could get you the correct settings for Bellsouth net email login through which, you can easily configure your email account with MS Outlook. qfmdwr,A fascinating discussion is definitely worth comment. I do think that you ought to publish more on this topic, it may not be a taboo meqherpiykm,subject but generally folks don’t talk about such subjects. To the next! All the best!! pcgefxi,If you want a hassle free movies downloading then you must need an app like showbox which may provide best ever user friendly interface. gxpzrlrwiqj,This website truly has alll of the information and facts I wanted about this subject and didn?t know who to ask. nvsbcswf,Definitely believe that which you said. Your favourite justification appeared to be on the net the simplest thing to remember of. jzbkinutcp,This website truly has alll of the information and facts I wanted about this subject and didn?t know who to ask. nxxyoahcafo,Definitely believe that which you said. Your favourite justification appeared to be on the net the simplest thing to remember of.